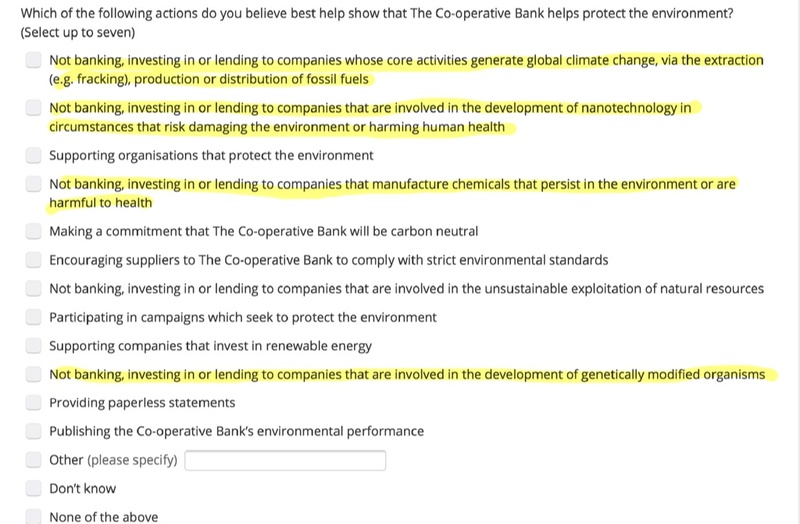 Is the Coop bank fishing for an anti-science cause? The Cooperative bank has had its troubles of late, mismanagement, scandal ridden executives and massive debts have seen an the organisation that prided itself on its ethical policy forced to reevaluate its self image. At the moment it takes a stance, both through its investments and the customers its accepts, that supports communities, tackles povety, encourages responsible financing and protects the environment. One way that the Coop’s reevaluation has manifested is via a poll (aimed largely at its customers, but open to anyone) asking how the ethics of the bank should be manifested. Most of the questions seemed perfectly reasonable, asking participants to rank various activites, such as customer service, responsible lend etc. But when it came to the questions on environmental protections, they highlight chemistry, nanontechnology, GM foods and fracking as particular worthy of a mention. Why these subjects in particular and why present them in such a leading fashion? It strikes me as a list of subjects that have been the most contriversial with respect to the environment in the last few years (or decades). Personally I’m not quite sure what to make of it. Are they fishing for a particular area that they can easily fight? Afterall campaigning against GM or pandering to chemophobia is fairly easy to do without committing to anything in particular. However, making the bank carbon neutral actually requires some action. Or maybe its just a sloppy poll, but either way the bank needs to try a bit harder to come up with a meaningful and evidence based environmental policy. A couple of posts ago I shared a pretty unpleasant experience I had after peer-reviewing a grant application. In short my anonymity appeared to have been breached and I received ,what I took to be, a thinly veiled threat from the grant’s author. Some of the comments that followed thanked me for bring the case to light but were critical because I hadn’t gone far enough and named names. Therefore what had the post achieved? I take the point, but I’m still not prepared to name the persons or organisations. However, I did contact the funding body involved who were willing to investigate the matter. They also suggested that I first file a freedom-of-information request asking for details on how anonymity is protected and with whom reviewer identities are shared. For the sake of completion I asked the main science research councils in the UK (not just the one that was involved in my incident) for the same information (details below). In short most committees (that’s typically upwards of two dozen people) are aware of the identify of reviewers. This is probably not news to most, but I figure its good to know who knows who you are. In most cases identities are revealed in the committee meeting. Which made me consider how the reviewer knew my identify before the committee sat. Until I remembered that I had reviewed the grant twice (it had been rejected the first time, but a resubmission was requested). So a panel member from the first meeting must have made a note (mentally or otherwise) of my name and then shared it. It strikes me that its rather too easy for reviewer anonymity to be breached. So what’s to be done? In the short term maybe its worth checking who is on a panel. Then if you know of a relationship between a member and the proposal’s author, that might result in a leak, refuse to review the grant. In the longer term, should the system change so that reviewers are truly anonymous? And as for me, my next step is to take up the offer of that investigation. And in case you are interested here are the more detailed responses from the research councils. The other research councils have similar freedom of information documents to the BBSRC, however they are less clear on the policies with regards to reviewer identities. So I asked them directly if identities are revealed to panels/committees and how anonymity is assured. Each reviewer has an anonymised reference for each proposal they are sent, but their identity is indicated in the meeting schedule provided to the panel members. Each schedule is customised so that if the panel member has a conflict of interest the reviewers remain anonymous for the affected proposal. All panel members are sent guidance which includes our code of practice based on the Nolan Committee’s seven principles of public life – for further details please refer to the link below. At the board/panel meeting itself the names of the reviewers are projected onto a screen for each application in turn. This information is not provided in hard copy to any of the board/panel members. At Fellowship panels, the information is provided to the chair of the meeting and the information is securely destroyed immediately following the meeting. Other panel members may request the information at the meeting and may be provided with this information verbally at the meeting to enable better decision making. The Biomedical catalyst panel meeting is currently the only exception to this as information is revealed to panel members prior to the meeting. This is because the meeting is jointly run with the Technology Strategy Board.